Douglas Trattner has covered home improvement for HGTV.com, DIYNetworks, and the Cleveland Plain Dealer. He lives in a 1925 Colonial. An out-of-shape house is older than its years and could lose 10% of its appraised value, says Mack Strickland, an appraiser and real estate agent in Chester, Va. That’s a $15,000-$20,000 adjustment for the average home. If you focus on nothing else, focus on moisture — your home’s No. 1 enemy. Water can destroy the integrity of your foundation, roof, walls, and floors — your home’s entire structure. So a leaky gutter isn’t just annoying; it’s compromising your foundation. 1. When it rains, actively pay attention. Are your gutters overflowing? Is water flowing away from your house like it should? Is water coming inside? 2. After heavy rains and storms, do a quick inspection of your roof, siding, foundation, windows, doors, ceilings, and basement to spot any damage or leaks. 3. Use daylight savings days or the spring and fall equinox to remind you to check and test water-related appliances like your washer, refrigerator, water heater, HVAC (condensation in your HVAC can cause leaks) or swamp cooler, and sump pump. It’s also a great time to do regular maintenance on them. Inspect any outdoor spigots and watering systems for leaks, too. 4. Repair any damage and address any issues and leaks ASAP. Don’t procrastinate when you spot minor leaks or drips inside your house. Ongoing small leaks can slowly erode pipes and fixtures, and even cause mold and mildew issues you won’t notice until it’s too late. Say you’ve got a bit of cracked caulk around the kitchen window. It may not seem like much, but behind that caulk, water could get into your sheathing, causing mold damage and rot. Before you know it, you’re looking at a $5,000 repair that could have been prevented by a $4 tube of caulk and a half hour of your time. Lara Edge has bought four homes, sold three, and downsized into an urban home less than half the square footage of her old one. She has 20 years of editing experience, most recently at HGTV, which inspired her to do some DIY, which gave her an invaluable lesson: Sometimes it pays to hire a professional. 1. Make sure your appliances aren’t being recalled. Why it matters: The non-profit Consumer Reports magazine wrote an eye-popping piece about how often home appliances catch fire: more than 150,000 residential fires each year from 2006-2008, resulting in 3,670 injuries, 150 deaths, and $547 million in property damage. About half the fires appear to have been caused by faulty appliances. Some had been recalled for defects that could cause an appliance fire, but the home owners weren’t aware. 2. Check for leaks and fix them. 3. Test your sump pump and backup pump (or install a backup pump if you don’t have one). 4. Renew the finish on your hardwood floors. Maintenance cost: If you just need the refresher coat and apply it yourself, you can do 500 square feet for around $25. If you hire a pro, figure on $1 per square foot. Worst case if you put it off: The finish wears through. If your floor is thick enough to sand, expect to spend $2.50 per square foot for a new finish. If the floor can’t be sanded, you’ll need a whole new floor — $8-$20 per square foot, if you stick with wood. Jeanne Huber is the author of 10 books about home improvement. She writes a weekly column about home care for the Washington Post. A new roof is an expensive proposition — $18,800 on average for composition shingles, according to Remodeling magazine’s Cost Vs. Value Report, and as much as $36,000 for high-end materials. Once you’ve made that kind of investment, you’ll want to protect it. And even if your roof is years old, maintaining it in good shape will prolong its life and keep you from having to replace it prematurely. 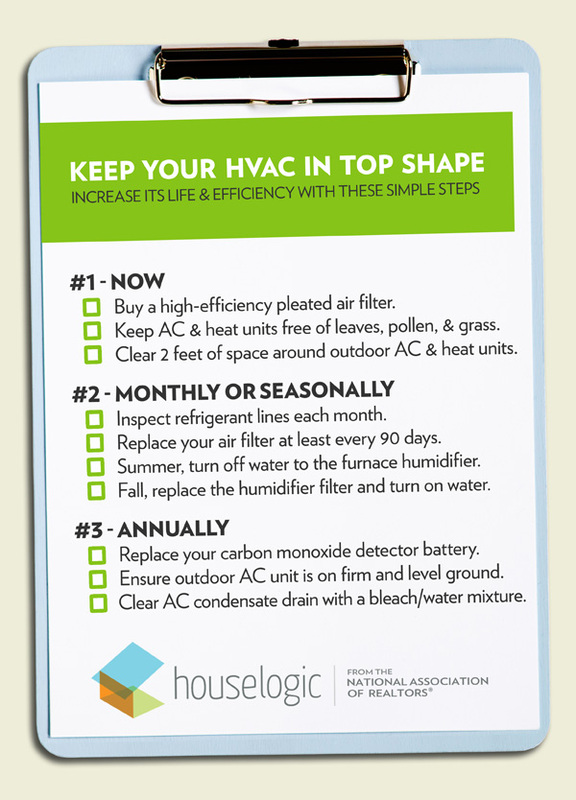 Here’s what you need to do to get the most from your roof. Ruined paint on siding and a wet basement are typical problems caused by clogged gutters, but it might surprise you to learn that the overflow can also go upward. When leaves pile too deeply in gutters, water can wick into roof sheathing and rot it, or even rot roof rafters. Fixing that kind of damage could run into the thousands of dollars, but you can avoid it by cleaning your gutters each fall and spring. Do it yourself in a few hours if you’re comfortable working on a ladder, or hire a pro for $50-$250, depending on house size. If you have a simple peaked roof surrounded by low landscaping, your roof probably stays clear of leaves on its own. But if the roof is more complicated or if towering trees are nearby, piles of leaves probably collect in roof valleys or near chimneys. If you don’t remove them, they will trap moisture and gradually decompose, allowing moisture to accumulate in your roof — or worse, create fertile ground for weeds to grow. If you have a low-slope roof and a one-story house, you may be able to pull the leaves down with a soft car-washing brush on a telescoping pole. Or you can use a specialty tool like a roof leaf rake, which costs about $20. A leaf blower gets the job done too, especially on dry leaves, but you or a pro needs to go up on the roof to use it. If leaves are too wet or too deep, you might need to wash them off with a garden hose. Don’t use a pressure washer, which can force water up under the shingles. In much of the country, composition roofs often become covered with black algae. Although unsightly, this filmy growth doesn’t hurt the roof. A little chlorine bleach or detergent mixed with water will kill it, but it’s safer for both you and the roof to just leave it alone. If you live in the Northwest, you’re likely to find moss growing on your roof, particularly on wood or composition shingles. Moss, which looks more three-dimensional than algae, needs to go because it traps water. If you tackle it early enough, you can just sweep it off. If there’s a lot of buildup, you may need to kill the moss first. The Washington Toxics Coalition recommends using products based on potassium salts of fatty acids rather than more toxic formulas with zinc sulfate. Even so, apply the soap only where moss is growing, and try to keep the wash water from getting into storm drains. Once the roof is clean and free of moss, consider investing in zinc strips to keep it from coming back. For about $300, a roofer will install strips near the top of the roof. When it rains, the runoff from the strips inhibits the growth of moss. It’s effective and more environmentally friendly than treating the entire roof with pesticide, as long as you don’t live near a stream or a lake where the runoff can harm aquatic life. A little prevention in the form of tree-trimming goes a long way toward keeping leaves and moss off your roof and keeping your roof damage-free. Abrasion from limbs and leaves that touch your roof can eventually damage shingles, especially in high winds. Overhanging branches also give squirrels and other rodents access to your roof. They can gnaw on your roof and siding. Branches need to be 10 feet away from your roof to keep these pests at bay. If that’s not possible, wrap the tree trunk with a sheet-metal bank to prevent them from climbing the tree. Trimming branches that hang over the roof is a job for a pro, though, or you might cause more damage than you prevent. If you’re plagued by ice buildup on the roof, removing some or all of the snow between storms might forestall leaks into your house. Don’t try to pry off ice that’s already formed, since that could damage the roof. Use a roof rake to dislodge snow within three or four feet of the gutters. Get a telescoping pole and work from the ground, if possible. If you must be on a ladder, work at an angle so the falling snow doesn’t push you over. Inadequate insulation and air leaks into your attic greatly increase the risk of ice dams, so once the storms pass, address those problems, too. After every big wind or hail storm, or if you’ve heard scurrying on the roof at night, give your roof a quick check to make sure everything’s still intact. If anything seems amiss, ask a roofer to inspect ASAP. Most problems are fairly easy to fix, but if you put them off and water gets in, the damage and costs escalate. TIP: You don’t have to climb a ladder to inspect your roof. You can use binoculars. 2014 looks to be the year of the repeat home buyer, as interest rates rise and home prices increase, worsening affordability will discourage some first time home buyers. These won’t be the only changes. Foreclosures’ slow inventory will begin to stabilize and the process of getting a mortgage will be less hectic. • Home Prices Will Rise, Affordability Will Worsen. Buying a home will be more expensive in 2014 than in 2013. The median price of a home in Jackson County increased by 18.2% in 2013, bringing it up to around $195,000. Although this is still far below the 2005 median of $271,500, it’s a nice increase. Mortgage rates will also be higher in 2014 than in 2013, thanks both to the strengthening economy and to Federal Reserve tapering. We are still looking at an incredible low 4.5% interest rate, but this is up from the 3.5% interest rate of a year ago. As of September 2013, Trulia has reported that buying was 35% cheaper than renting nationally. Buying also beat renting in all of the 100 largest metros surveyed. • Home Buying Process Improves and Inventories Increase. Home buyers in 2014 might kick themselves for not buying in 2013 or 2012, when mortgage rates and prices were lower, but inventory will be increasing and lenders will be less preoccupied. There will be more inventory on the market later this year, partly due to new construction, but primarily because higher prices will encourage more homeowners to sell – including those who are no longer underwater in their mortgages. Finally, mortgage approvals should be easier to get because higher rates have slashed refinancing activity and pushed some banks to ramp up their purchase lending. New mortgage rules coming into effect in 2014 will change which types of loans are more competitive. It seems like government backed loans will soon be less competitive to those offered by commercial banks, hopefully making them more willing to loan. All in all, more inventory, less competition, and more mortgage credit should combine to make the buying process easier in 2014 – for those who can afford to buy. • The Year of the Repeat Buyer. 2013 was the year of the first time home buyer, but 2014 will be the year of the repeat home buyer. Investors will still be a factor in 2014 but higher prices mean that the return on investment falls. Repeat buyers selling their current homes which have risen in value, and either relocating or upgrading, will make up the majority market segment this year. The amount of Escapees from nearby states will continue to increase as Oregon has the largest percentage of people moving into the state vs. people moving out of the state compared to any other state. We will see a heavy increase in the amount of Retirees as they have been waiting through six years of recession to finally see their stock portfolios rebound and their home equity swell to make retirement possible. Retirees will find Southern Oregon and our unique combination of nature, culture, affordability and great health care to be a suitable place to retire. • Foreclosure Activity will Slow. Foreclosure sales are likely to play a minimal role in the housing market in 2014. They are not gone but they are less important. Foreclosure inventory has dropped in the U.S. to multi-year lows, down nearly 33 percent since the end of 2012. The numbers of new foreclosures were down 39 percent in the third quarter of 2013 to the lowest levels since the second quarter of 2006. In 2013 foreclosures amounted to only 7.1% of the homes sold in Jackson County. • Rental Market Continues to be Strong. Throughout the recession, investors bought homes and rented them out, sometimes to people who lost a home to foreclosure. Going into 2014, we will see fewer families losing their homes and fewer investors buying single family homes, preferring instead multi -unit complexes with higher returns. Increasing prices of both homes and mortgages will make it more difficult for renters to buy their first home. Ironically, the economic recovery means that the overall homeownership rate will probably decline, as young adults move out of their parents’ houses and form their own households they will add to the amount of renters, not buyers. In 2014, we will continue to see an increase in demand for single family homes for rent but a decrease in supply. So, hang on! 2014 will be another year of great recovery for the housing market. We’ll see increasing equity for homeowners, continuing low interest rates, & increasing market inventory. Welcome to “The year of the repeat buyer”! Jackson County has had an incredible year in the Real Estate Market. Home prices in most metropolitan areas of the United States grew significantly in 2103, with the national median price rising at its fastest annual rate in eight years. The good news is Jackson County has exceeded the national average with median price (meaning half the homes sold over this number and half sold under) of a home increasing by almost 20% in 2013*. This increase is due in part to home prices increasing and in part to the make-up of those homes that sold. For example, In Jacksonville the median price has increased by 77% mainly due to more than three times as many homes selling over $500,000 in 2013 than sold in 2012. All in all 2013 marked the first year of significant recovery with double digit growth and the return of the high end housing market. Bottom Line: Home prices have increased, selling closer to list price and moving quicker. High end home sales are back for the first time in seven years! It depends if you need a loan or not. If you want to sell your home and buy a new home with cash then time is on your side as prices will continue to increase. However, if you want to sell your home and buy a new home requiring a loan, time isn’t on your side. Your home price will increase with time but interest rates will also increase so you may be better off selling sooner than later. Buy now! We are at the point where both home prices and interest rates are climbing. So right now the timing is as good as it will get and time isn’t on your side. As home prices and interest rates both climb capitalization rates will decrease. The supply of homes has been limited with little to no building in the last seven years. Rental rates have climbed and will continue on this path. Cost of borrowing monies and purchasing a home is also climbing. Right now is as good as it will get for investors. As stated above the supply of rental homes has had little to no increase in the last seven years while the demand for rental homes has increased. The growing population combined with the decreasing percent of ownership has increased demand for rental homes. We foresee rents continuing to increase and the majority of tenants will actually pay less in a monthly mortgage then they are paying now for rent. So again, now is the time to buy! Continue Quantitative Easing: The Federal Government has done a great job using “Quantitative easing” to create a cheap supply of money, giving us historically low interest rates which in turn have stabilized the economy and improved the housing market. Quantitative easing must continue until we achieve a healthier economy with high employment and higher wages. The soon to be Federal Reserve Chairwomen, Janet Yellen, has gone on record stating she will continue to stimulate the economy at current levels. Slow foreclosures: We have seen a drastic decrease in the number of bank-owned properties. Banks have written off the majority of bad home loans but have taken little to no action on thousands of home loans that are currently in default. As prices increase time is on the banks side and they can increase their efforts to refinance loans in default instead of pursuing foreclose process. It’s critical that the banks continue their slow pace of foreclosing and not flood the market with excess inventory. Ease lending requirements: The last few years we have seen strict lending requirements that require higher credit scores, no discrepancies in credit history, and higher income. The approval process that has become grueling with endless documentation. Some of these new requirements are positive but in many cases we have overcompensated and standards need to be loosened. Unfortunately, we don’t see these standards changing in 2014 but they will need to be addressed to increase the numbers of homes sold in the future and achieve a full housing recovery. If in 2014 we experience the same rate of recovery as 2013 we will soon be well on our way to a fully recovery in the real estate market in Southern Oregon. *Stats taken from Southern Oregon Multiple Listing Service. Because this article was written November 15th the stats are from the beginning of both years but ending on Nov 15th so they are for a 10.5 month period.